If you want a new dining experience in Downtown Omaha, may we suggest the al fresco atmosphere at 1110 North 11th Street (11th & Nicholas) in north Downtown Omaha? This is where several popular food trucks gather Monday through Friday from 9 a.m. to 2 p.m. from April through September. Mosaic Pickle: Mexican and American classics like chicken fajitas, hamburgers, chicken quesadillas, and pulled pork with rice. Cash only. Vegetarian options are available. Island Seasons: Jamaican jerk chicken, and American fare like hot dogs, sandwiches, and wraps. Groove to Jamaican music while you eat. The Sandwich Shop: Truck food is finger food, so the variety of sandwiches and subs serve here fit in your hand. 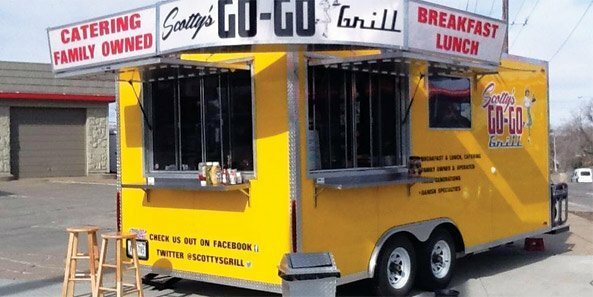 Scotty’s Go-Go Grill: Popular menu items include the barnyard burger — a cheeseburger topped with fried chicken and bacon. Some great breakfast offerings as well, like French toast and cheddar, bacon, and egg panini, for only $5! Some trucks accept credit cards, others only cash, so come prepared to pay either way. The operators will offer specials throughout the season. We will be adding a canopy tent for a shady spot to dine and picnic tables are available for seating. The trucks will be on-site during the College World Series and continue through the end of September.